These are off my video camera so apologies for lack of crispness. 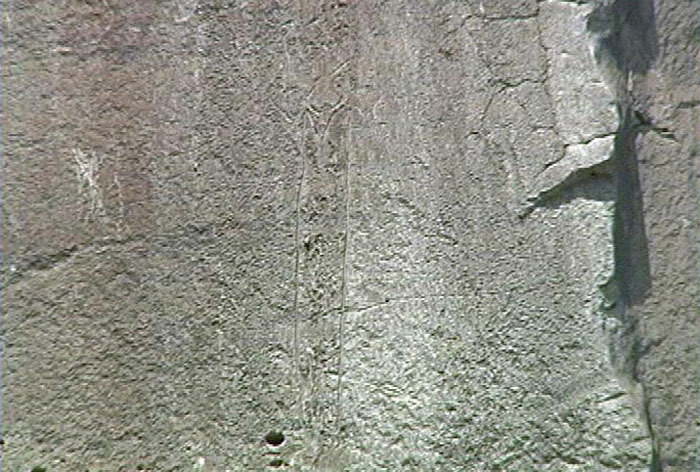 The first video frame is of Deer Medicine Rock itself. 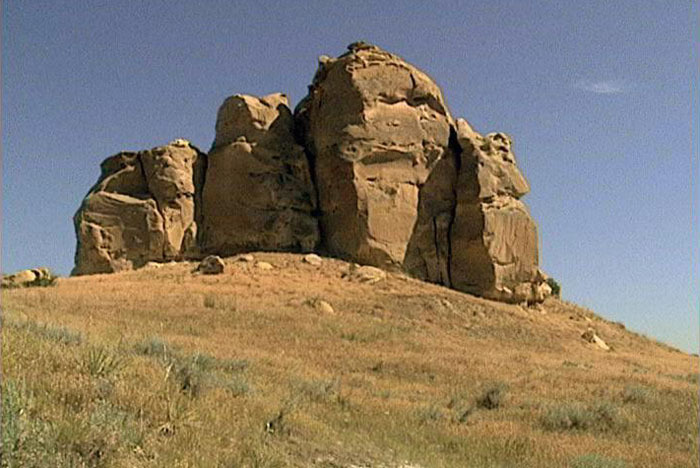 Deer Medicine Rock currently sits on Jack Bailey's farm just on the north side of the Northern Cheyenne Rez on the road from Lame Deer. His family has owned the land since about 1878. 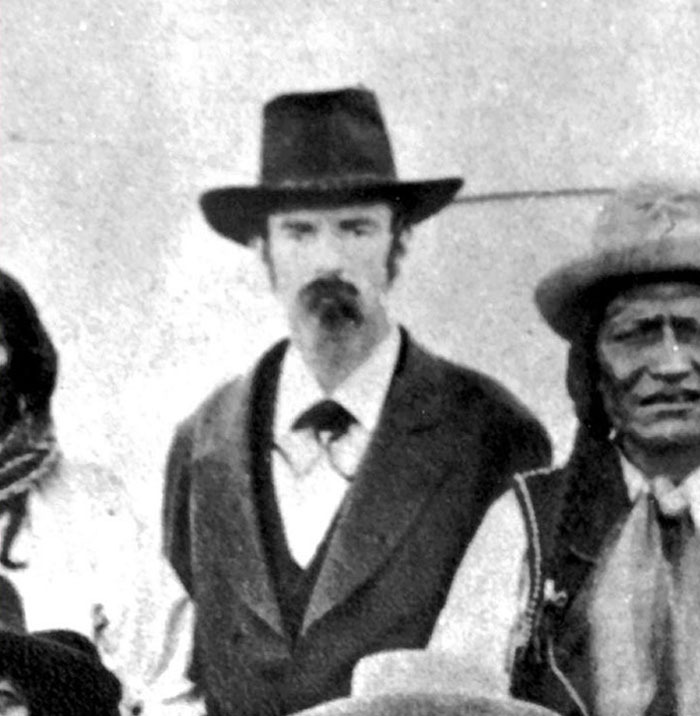 Floyd Clown, Doug War Eagle, and Don Red Thunder, all of the Clown family, scraped together the gas money to go see Crazy Horse's carving of his vision of his death. It is at the Deer Medicine Rock Sun dance grounds. 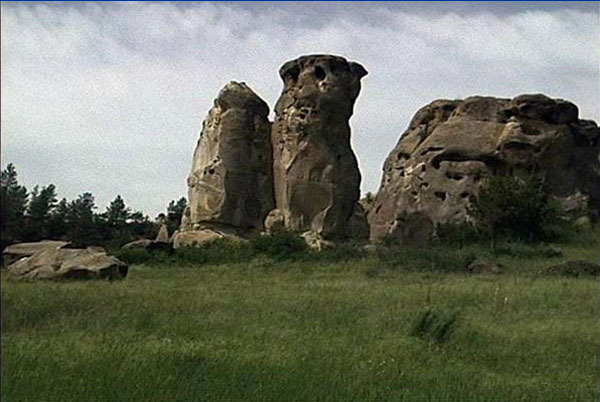 The three had never been to the sun dance grounds but had only heard of it and Crazy Horse's carving in stories that their grandfather, Ed Clown, had told them. Jack Bailey, who has seen literally thousands of visitors at his farm who come to see Deer Medicine Rock, greeted them. 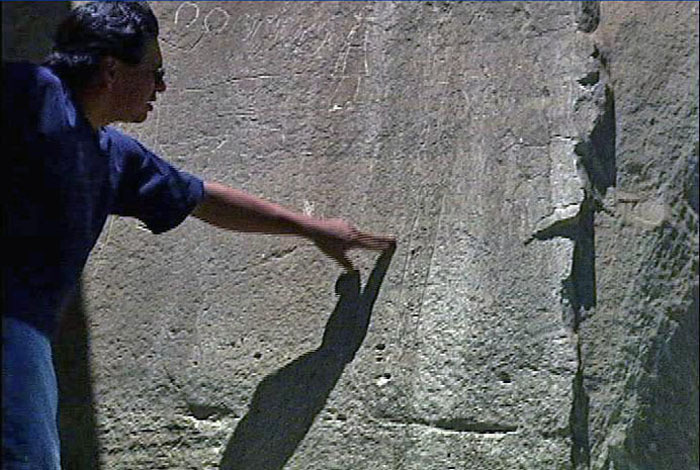 They told him they were there to find Crazy Horse's death vision and that it was on the belly of a rock that was shaped like an owl. 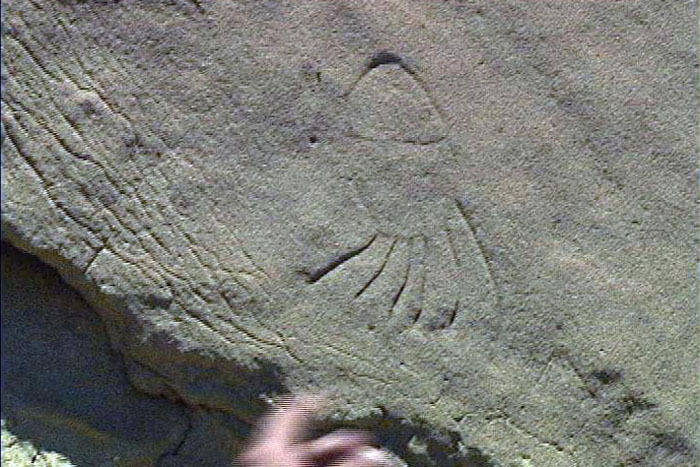 After all these years, and Jack is in his 70s, nobody had noticed or commented that the rock in question looked like an owl. But indeed it does. 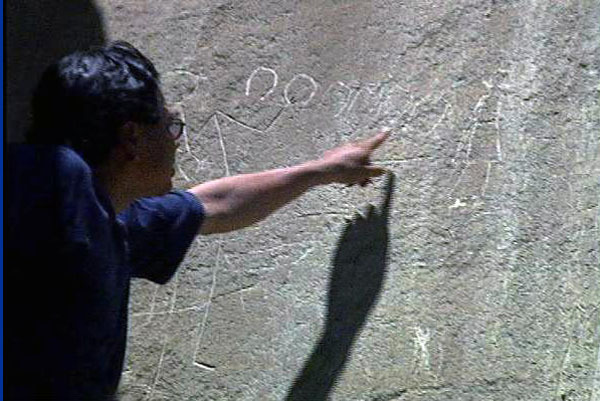 On the belly of the owl is carved the story of his death. This was new to Jack who had always heard the Cheyenne version saying it was a priest that was talking to the Indians. But after this particular visit he doesn't believe that anymore. In shot one Doug points out how the horse hooves are standing up. That means life or he was alive at the beginning of the carving. In the next part of the carving their are two spear like objects entering Crazy Horse's self portrait about the liver and kidney area. This represents the stab wounds inflicted by the bayonet. 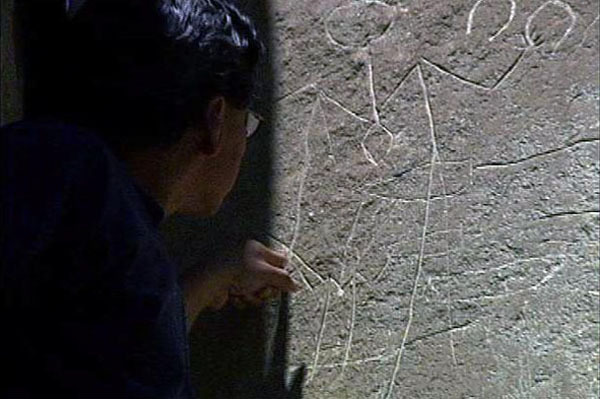 As we study the drawing further, Doug points out a sign within the carving that he would be betrayed or that it would happen behind his back. We also see the first horse hoof laying sideways just underneath the two spears. In this portion of the drawing we see a long line of horse hooves laying down. This means he lost his life. Standing on top of the horse hooves is a white man with a hat. This is what the Cheyenne thought was a priest. But the Clown family says this is Dr McGillicuddy, the doctor that tried to save his life. To the right of the man with the hat is another figure standing directly in the fallen horse hooves. He represents Little Big Man according to the family. And here's a picture of Dr McGillycuddy blown up from a group photo taken at Camp Robinson in 1877. I stumbled on this earlier this year. Notice the hat and the coat. 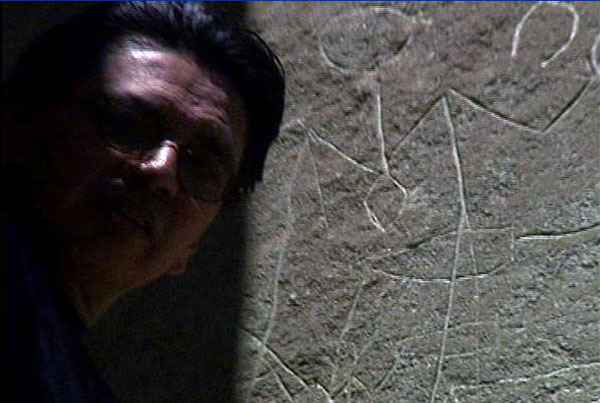 In the last part of the carving is the private who stabbed Crazy Horse. 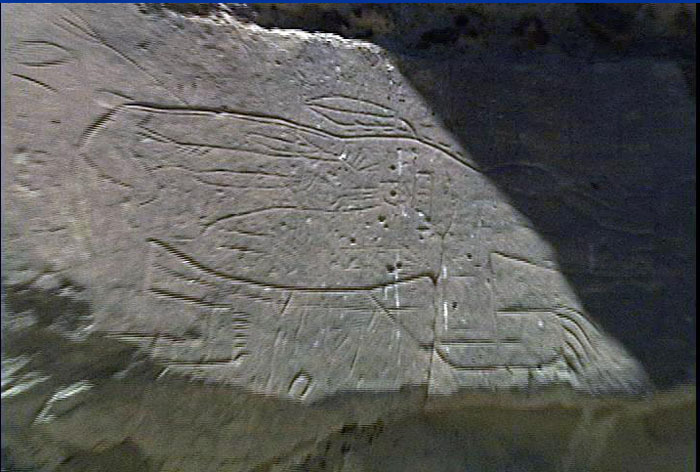 Although it is tough to make out due to the light and some of the carving is shallower than other parts, the private is on a parallel line with Little Big Man. This is just a little closer look at the private with a line representing a bayonet. Back on Deer Medicine Rock here is a calendar documenting their stay. The circle represents a day. The line divides the circle into day and night. There are six lines drawn from the circle. This means they camped at the Sun Dance ground for six days. Doug War Eagle is the source. Here's another drawing on Deer Medicine Rock that pertains to their family. I wasn't able to include this picture in the documentary as I seem to have more info than room on my DVDs. Maybe I'll switch sides and write a book (lol). This is supposed to be Bear With Horns. He was mortally wounded at the Battle of the Little Bighorn and was kept alive for four days with 'bear medicine' and died at Slim Buttes. 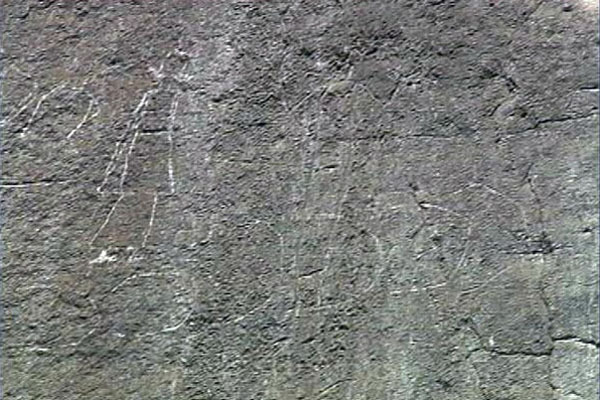 The bear is considered the healing animal for the Lakota. It is the animal that lead them to their medicines. When a bear was sick and it showed in his feces, then they would follow to see what roots he would dig up to cure himself. This would cue the Lakota to use the same medicine on themselves. So inside Bear With Horns is another bear. It represents the bear medicine given to him by a medicine man who had followed a wounded bear and knew what medicine would keep him alive, albeit temporarily. This next picture is just Rosebud Creek for all of you who have never seen it. 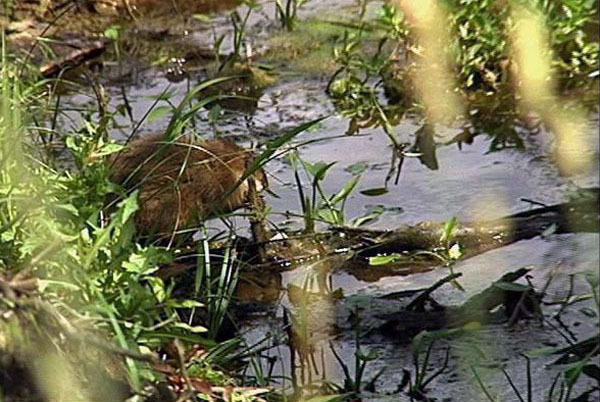 A beaver decided to ham it up for my video camera. 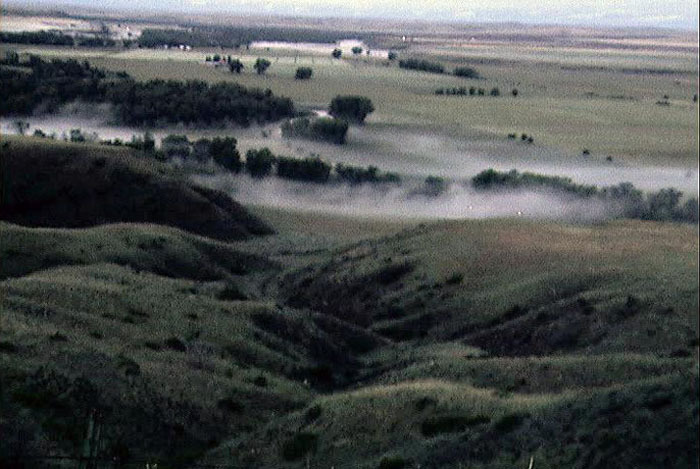 And finally here is what the Little Big Horn River area looks like in the early morning. I took this shot just after dawn on June 25. I thought it interesting because I had never read anyone talking about the morning mist when looking off at the village from the Crow's Nest. For those who wish to visit Deer Medicine Rock you have to call Jack Bailey first. He's been an outstanding caretaker of this treasure and if his family ever sells the land I would hope the state or feds would step in to purchase the Deer Medicine Rock area. When I have more time I'll post Ernie LaPointe's stories and pictures off the video from the Smithsonian.